This is a small camera is of 7 cm long by 1.5 wide which clips onto the arms of glasses. An ultra-light device (25 g) that allows an artificial intelligence to decipher a real-time text and read it via a small speaker located above the ear. But also to recognize the products (brands at the supermarket, bank notes, cards) and faces of loved ones, via an application of facial recognition. Created by two israeli researchers from the Hebrew university of Jerusalem, Amnon Shashua and Ziv Aviram, the visual wizard MyEye 2.0 is now available in France. It was introduced to the World of optics, which was held at the Villepinte exhibition centre from 28 September to 1 October. 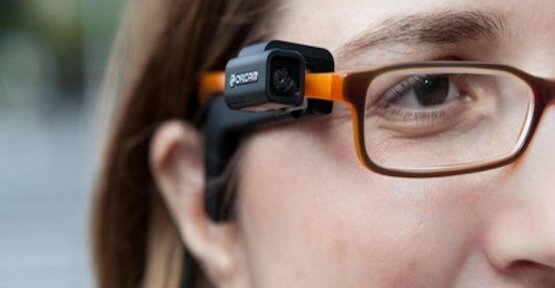 "Its cost (around 3 300 euros) the reserve to a category of people rather easy, but we have initiated discussions with several private insurance companies who consider the ability to repay it," recalls Delphine Nabeth, responsible for the distribution of the product in France for the account of the company OrCam Technologies. The israeli company should soon no longer be the only one to propose such a device for visual assistance. Microsoft reported in may last, having developed, in partnership with the California Institute of Technology, a application, a variant of his glasses HoloLens was originally created for the viewing of holograms applied to video games or work remotely. This tool, which has the allure of a virtual reality helmet allows to decrypt the user's environment and report to him, through a synthetic voice, the obstacles that come in his way (doors and stairs). Its designers provide be able to guide the blind, again thanks to the artificial intelligence onboard, indicating the route through a built-in GPS, and indicating how to cross the streets and around pedestrians and pieces of street furniture that may be present on the path. If this prototype is not yet marketed, other companies have developed eyeglasses equipped with a device of "augmented reality" (such as Google and Brother) are also looking at products for the visually impaired. what revolutionize the lives of the blind. The world health Organization (WHO) estimates around 45 million the number of blind people in the world. More than 217 million people would be affected by a visual impairment. An increase of 35 % compared to the 90's. The world population is increasing (and aging), the number of non-seers could triple by 2050. The following video (spot produced by the company OrCam) presents the operation of the device MyEye.